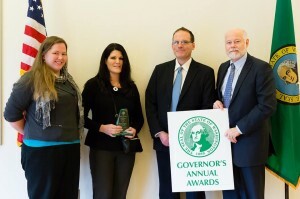 Annual Governor’s Employer of the Year Award! The Washington State Governor’s Committee on Disability Issues and Employment (GCDE) has announced the winners of the 21st annual Governor’s Employer of the Year Award. This year’s winner for the small private employer is Anytime Fitness of Lake Stevens. The award honors businesses who have demonstrated exemplary practices to recruit, hire, retain and promote individuals with disabilities. Award winners were recently honored at a ceremony in the Olympia area. Anytime Fitness was nominated by Work Opportunities, a local non-profit agency providing job development, job coaching and long term support for persons with disabilities. A number of years ago Jennifer Smith, the owner of Anytime Fitness, was approached by a Work Opportunities Employment Specialist who was assisting an individual with a disability in his job search. Jennifer and her team agreed that hiring someone with a disability was something that they wanted to do, and hired a person through Work Opportunities to be a gym attendant. Since that time, this arrangement has become successful for both Anytime Fitness and the individuals that they have hired through Work Opportunities.